There is always something refine and elegant about French cuisine. At one point in medieval time, did you know that French cuisine was heavily influenced by Italian cuisine? You might want to check that out in Wikipedia here about the French & Italian connection in the cuisine. That of course explains as well why French enjoys pasta as well as all the stews which Italian cuisine is also famous for. Taking on the French & Italian connection is Topshelf, a restaurant located in a discreet row of shops in TTDi. Topshelf offer foodies and epicures a taste of classic French and a blend of Italian cuisine set in an elegant and minimalist ambience. The interior is sleek with an urban industrial theme. 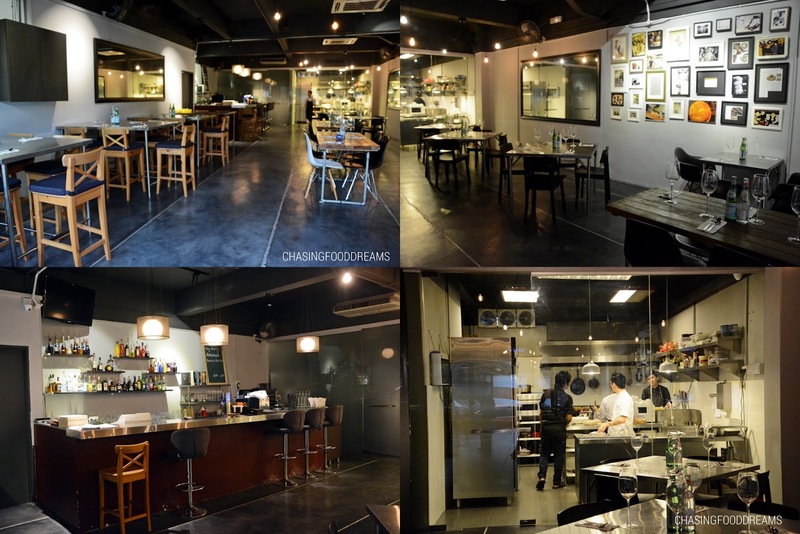 At the end of the space, one can see a glass encased kitchen where several chefs and their kitchen team is busily whipping up dishes in an orderly and calm manner. It can be quite romantic at Topshelf as the ambience are lit by soft glows of yellow bulb lights and yet casual enough for parties. Topshelf’s menu is tight and lean, offering a solid list of French and Italian favorites. There are specials of the day and the restaurant also has a nice list of wines to go with the menu. There is also a chef’s table menu with wine pairing for the adventurous gastronomes. Owner and Chef Christopher may look deceivingly young but he dishes spoke of experience and talent as well as precision for flavours. The French and Italian loves their bread and Topshelf’s bread was such comforting pleasure of crusty bread with a light chewy and soft flesh served with extra virgin olive oil and balsamic vinegar. Served warm, we happily polished off the bread in anticipation of our dinner of the new menu at Topshelf. From the Entrée section, dinner started with Prawn Bisque (RM16), a bowl full of crustacean essence richly divine and made for lusciousness on the palate. The prawn bisque is nicely rich and yet doesn’t overwhelm the taste bud. I tasted the presence of brandy in the bisque which really pumped up the flavours of the dish while a dollop of sour cream added creaminess to the bisque. The next dish of Orange Quail (RM27) had some of us praising how dainty and pretty the quail looks sitting on a bed of fried leeks. It is served with a side of bacon hash and a poached egg. The dish is an elegant combination of ingredients that embraced comfort pleasures. The quail was gorgeously roasted till just right and was beautifully succulent. When savored with the delicate oniony leeks and the molten egg yolk, the quail was superbly luscious in flavours. The bacon hash is pretty good and goes well with everything else. It reminded me of breakfast for some reason but with an added bonus of the quail. I believed we were all fighting for the Hand Dived Scallop (RM30) the moment this arrived. One large nicely seared scallop reigning glory on its own shell and is served with braised leeks and miso eggplant in white wine. The soft nuances of the velvety leeks matched well with the sweet scallop, beckoning most of us for more of it. A nutty and savory tender eggplant beneath the scallop and leeks was a good touch of flavours to balance up everything nicely. I couldn’t help but to wish for more than one scallop on this dish! For mains, we had the French classic Duck Cassoulet (RM38). Making Duck Cassoulet is a time-consuming process and I am glad to leave this to the experts. Duck leg is slowly confit and crisp up just before serving. The rich tomato stew of white cannellini beans, bacon, sausage and potatoes is delicious and paired well with the tender rich dark meat of the duck. The dish is earthy at sight and has an air of sophisticated flavours that I really enjoyed. A must-order here at Topshelf! Our next dish of Iberico Loin (RM56) was decent. It’s a good piece of pork loin nicely cooked and served with potato puree and sautéed mushrooms and vegetables. Nothing to fault but just on a personal note, I seemed to favor the Duck Cassoulet over this dish for some reason as the duck had more richness of flavours. Baked Snapper (RM40) featured a whole red snapper roasted and served with Provencal vegetables cooked in white wine bouillon. The fish is moist and sweet. I really enjoy the delicate flavours of the fish together with the soft vegetables in a tasty light broth. Once again, the French showed us that their cuisine can be elegant and yet earthy and humble in flavours. Another dish that is classic French is Pot Au Feu (RM43). This dish of slow cooked beef in light vegetable broth also showed off the humble side of French cuisine. It may sound and look deceptively simple but the dish is a bowl of beefy and earthy flavours. The tender chunks of beef are well-braised till fork tender. French cut potatoes and carrots together with baby shallots have also soaked up the flavours of the broth and are enjoyable with the beef. It’s another comfort dish that one can enjoy daily. Roasted Rack of Lamb (RM55) proved to be a hit at our table. The chargrilled lamb rack with broccoli salad, potato puree and jus is perfect for meat lovers. The four French cut lamb racks has a good ratio of fats which has also been nicely rendered and charred, emitting a lovely aroma and flavour to the lamb. It was juicy and tender as well. I like the chargrilled broccoli salad as it added a nice smoky aroma to the crunchy vegetable and is pretty unique as well on flavour. We ended our mains with Pesto Capellini (RM30), a dish that showcased simplicity at its best! Topshelf housemade pesto, truffle oil, pine nuts and parmesan cheese flavoured the thin and tender cappelini pasta well. Flavours are robust and fairly intense as it should be when it comes to a good pesto. I get a good hit of garlic, cheese and herbs together with a nutty note and was very pleased with this pasta dish. Desserts are simply a must in any French restaurants. The French are famous for their sweets and chocolates so it is without a doubt that we had their Chocolate Fondant (RM21) and Chocolate & Coffee Cremeux (RM19). The Chocolate Fondant is made from Varlhona 70% cacao and is sinfully dark and luscious. The velvety molten chocolate center is absolutely divine and when paired with vanilla ice cream, I was literally on cloud nice! The Chocolate & Coffee Cremeux (RM19) was made with 70% noir dark chocolate as well and was another sinful dessert that played on the taste sense. The dark bittersweet chocolate and coffee cream had a touch of maldon sea salt to heighten its flavours so one to experience the sensual taste of sweet and savory in one taste. A drizzled of olive oil made it silkier while the berry compote lifted the heavy flavours with its light tang. Topshelf’s new menu is a French gem! The list of classic French dishes are simply a must order such as the Duck Cassoulet, Pot Au Feu, Orange Quail and Baked Snapper. Besides the above, there are other dishes that I would love to return for such as the Moules Mariniere, Chicken Liver Pate, Chicken Confit and Carbonara. Make sure to save room for desserts as Topshelf also has Apple Tart Tatin, a favorite classic French dessert of mine! have definitely earned a treat day for yourself today! Enjoy!